Some powerful rulers of the world may dream of the possibility to get in touch with their colleagues on different continents unnoticed by friends or foes. Someday, new quantum technologies could allow for making these wishes come true. Physicists around the world are working on the realization of large scale quantum networks in which single light quanta transfer (secret) quantum information to stationary nodes at large distances. Such quantum networks' fundamental building blocks are, for example, quantum repeaters that counteract the loss of quantum information over large distances, or quantum logic gates that are necessary for processing quantum information. Core element of the experiment (see figure 1) is an asymmetric high-finesse optical resonator, consisting of a high-reflection mirror (left) and a mirror with a finite transmission (right). Two electrically neutral rubidium atoms are trapped in the centre of the cavity. Each atom carries a qubit, i.e. quantum information that is encoded in the superposition of two stable ground states which correspond to the classical bits "0" and "1." "One of the ground states is in resonance with the cavity's light field. Hence, atoms and cavity form a strongly coupled system," Stephan Welte explains, who works on the experiment for his doctoral thesis. "That's why the atoms can talk to each other. This process cannot take place in free space." To execute the gate, single photons are sent onto the semi-transparent mirror. Then, depending on the initial states of the atoms, different scenarios are possible. "When both atoms are in the non-coupling state the photon can enter the cavity, and a standing light wave between the two mirrors builds up," says Bastian Hacker, another doctoral candidate on the experiment. "The atoms can communicate via this light field: if it is present, the phase of the stored qubits gets rotated by 180 degrees." In all other cases, if one or both atoms are in resonance with the cavity modes, the photon gets blocked from the cavity, and the state of the atoms does not acquire a phase shift. These effects are used to execute basic mathematical operations (quantum gates) between the two atoms, as is demonstrated by the Garching team with two characteristic gate operations. On the one hand, the scientists show that their experimental setup can work as a typical C(ontrolled)NOT gate: here the input state of the (control) qubit decides whether the other one's (target's) state is being changed or not. In order to demonstrate this functionality, the gate operation is executed on a set of four orthogonal input states, and in each case the resulting output state is determined. From these measurements a table is derived that resembles a classical XOR gate. On the other hand, in another series of measurements the scientists prove the creation of quantum entangled output states from two initially independent atoms. "To this end, the atoms are prepared in a coherent superposition of both ground states," Stephan Welte points out. "Therefore, both cases – that the photon enters the cavity and that it is rejected – are quantum-mechanically superimposed, and the gate operation leads to the entanglement of the atoms." "The mechanism underlying the gate operation is very simple and elegant because it only comprises one physical step. In contrast to other gate mechanisms the distance between the qubits – in our case 2 to 12 micrometres – does not matter at all," Bastian Hacker emphasizes. "Also, our gate does not rely on the specific platform of rubidium atoms. 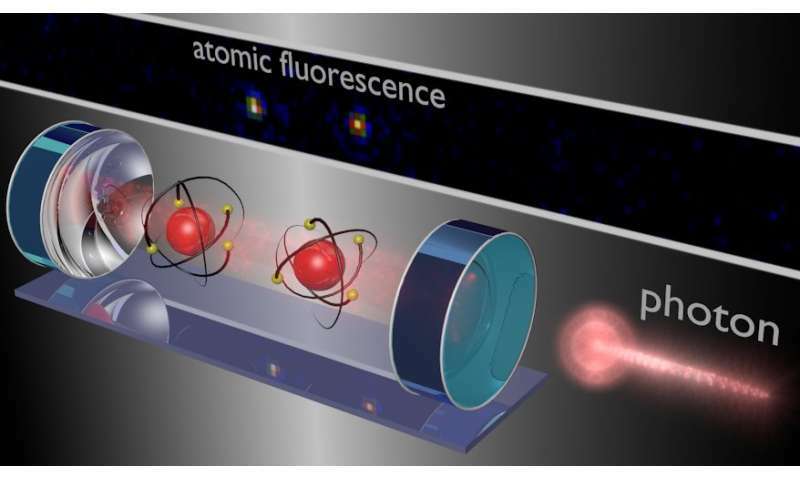 It could equally well be applied to many other types of atoms, ions or, for example, solid state quantum dots that carry quantum information." Professor Gerhard Rempe even envisions further extensions of the system. "We consider placing several atoms, instead of just two, into the cavity. Our gate mechanism could operate on many of them at the same time." In a large-scale quantum network, multi-qubit nodes could serve as small quantum computers that perform basic computations and send their results to other nodes.